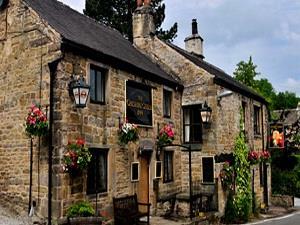 The Cheshire Cheese Inn01433 620381work InnSituated in the heart ot the Peak District, the 16th Century Cheshire Cheese Inn owes its name to being an overnight stopping point on the old salt carrying route from Cheshire across the Pennines to Yorkshire. Payment for lodgings at the Inn was actually made in cheese. Some of what 'The Cheshire Cheese Inn' has to offer: ensuite accommodation, log fires and traditional beams. Private beer garden, real traditional ales, malt whiskies and a tempting wine list, delightful walking country close to the Pennine Way and dogs are welcome in the Inn.